The Young Artist Award (originally known as the Youth in Film Award) is an accolade bestowed by the Young Artist Association, a non-profit organization founded in 1978 to honor excellence of youth performers, and to provide scholarships for young artists who may be physically and/or financially challenged. 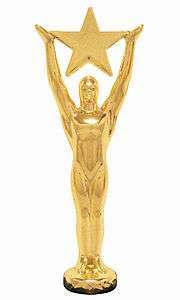 The 1st Youth In Film Awards ceremony was held in October 1979, at the Sheraton Universal Hotel in Hollywood to honor outstanding young performers of the 1978/1979 season. The 35th Annual Young Artist Awards ceremony, honoring young performers of 2013, was held at the Sportsmen's Lodge in Studio City, California on May 4, 2014. First presented for the 1978-1979 entertainment season, the awards were envisioned by Maureen Dragone, as a way to honor talented young people in film, television and music who might otherwise be eclipsed by their adult co-stars. Two notable examples that year being young Ricky Schroder in The Champ and Justin Henry in Kramer vs. Kramer, who were each nominated for Golden Globes in the same categories as their adult counterparts. Originally held in the autumn in its early years, the awards ceremony has traditionally taken place in the spring for more than 20 years. Over time, the competitive categories have been expanded to include "Best Young Actor and Actress in an International Feature Film", "Best Young Actor and Actress in a Short Film", "Best Young Supporting Actor and Actress in Film", "Best Young Ensemble Cast", "Best Young Recurring Actor and Actress in a TV Series", and "Best Young Guest-starring Actor and Actress in a TV Series", with many of the categories being split to acknowledge young artists age 10 and under in their own separate categories. In addition to its well known film and television awards, the association has also recognized the achievements of youth in other fields of the performing arts over the years, including theater, dance, commercials, journalism, radio and stand-up comedy. The ceremony is held annually in Hollywood and has traditionally been considered one of the more formal children's awards ceremonies, with honorees and their chaperones "dressing-up" for the occasion, and arriving in limousines. All press is invited to attend the pre-show red carpet arrivals as young celebrity attendees make their entrances and sign autographs, and each year's presenters are often selected from the previous year's young winners or from that year's list of nominees. After the ceremony is the annual banquet dinner and then dancing with live musical entertainment often provided by talented young musical artists of the day. In September 2016, the Los Angeles Times described the event as an unsecured one that rarely helps to launch the careers of the young thespians, but has been used by pedophiles in the past to prospect and engage more closely with their victims. 1 2 3 4 5 6 7 Crouse, Richard (2005). Reel Winners (illustrated ed.). Dundurn Press Ltd. pp. 42–43. ISBN 9781550025743. 1 2 Riggs, Thomas (2007). Contemporary Theatre, Film and Television. 74. Gale / Cengage Learning. ISBN 9780787690472. 1 2 3 4 5 "HFPA Golden Globes - Young Artist Foundation". GoldenGlobes.org. Retrieved 2011-03-31. 1 2 3 "KABC-TV - Budding stars shine at Young Artist Awards". ABCLocal.go.com. Retrieved 2011-03-31. 1 2 3 4 5 "Young Artist Awards - President's Message". YoungArtistAwards.org. Retrieved 2011-03-31. 1 2 3 4 "Young Artist Awards - Nomination Submission Requirements". YoungArtistAwards.org. Retrieved 2012-02-27. 1 2 "Former child stars Jackie Coogan and Jane Withers got together for the first "Youth in Film Awards"". Associated Press. 1979-10-16. Retrieved 2011-03-31. 1 2 3 4 "Coleman, Jackson and King Garner Youth Awards". Jet Magazine. 1979-11-08. 1 2 3 4 5 "Young actor receives TV award". The Ottawa Citizen. 1979-11-24. ↑ "35th Annual Young Artist Awards". Young Artist Awards. Retrieved March 30, 2014. ↑ "Young Artist Awards - President's Message". YoungArtistAwards.org. Retrieved 2011-03-31. ↑ "Young Artist Awards - Scholarship Fund". YoungArtistAwards.org. Retrieved 2011-03-31. 1 2 "1st Annual Youth in Film Awards". YoungArtistAwards.org. Retrieved 2011-03-31. 1 2 "20th Annual Youth in Film Awards". YoungArtistAwards.org. Retrieved 2011-03-31. ↑ "21st Annual Young Artist Awards". YoungArtistAwards.org. Retrieved 2011-03-31. 1 2 3 4 5 6 7 8 "The Kiddie Oscars". The Evening Standard. 2001-03-30. 1 2 3 4 "I just want to thank my mom". The Independent. 2000-03-26. 1 2 "Laurel Springs Students at Young Artist Awards". LaurelSprings.com. Retrieved 2011-04-04. ↑ "Youth In Film Awards - "The Oscars for kids"". Flickr.com. Retrieved 2011-04-04. 1 2 "Child Actor Off to Hollywood". Langley Advance. 2009-03-27. ↑ Jon Anderson (May 6, 2013). "Actress, Hoover native Savannah Lathem wins Young Artist Award for 'California Solo' movie". AL.com. 1 2 3 "Hollywood's Youngest and Brightest Shine". PRWeb.com. Retrieved 2011-04-04. ↑ "Drew Barrymore At The 1982 Youth In Film Awards". LIFE.com. Retrieved 2011-04-04. 1 2 3 4 "PopStar - 30th Annual Young Artist Awards". PopStar.com. Retrieved 2011-04-04. 1 2 "Dana Plato Holds Youth In Film Award". LIFE.com. Retrieved 2011-04-04. ↑ "Joey King Holds Young Artist Award". GoldenGlobes.org. Retrieved 2011-04-04. 1 2 "Young Artist Award arrives in Russia". StreetMagic.ru. Retrieved 2011-04-06. 1 2 "Hollywood Applauded Langley Lad's Acting". Langley Advance. 2009-04-03. ↑ "Robert McNaughton - The Older Brother in E.T.". Boy's Life. September 1984. 1 2 3 "32nd Annual Young Artist Awards". YoungArtistAwards.org. Retrieved 2011-04-06. ↑ "6th Annual Youth in Film Awards". YoungArtistAwards.org. Retrieved 2011-03-31. ↑ "10th Annual Youth in Film Awards". YoungArtistAwards.org. Retrieved 2011-03-31. ↑ "5th Annual Youth in Film Awards". YoungArtistAwards.org. Retrieved 2011-03-31. ↑ Brown, Maressa (2006-03-23). "Variety - Meyerink gets life kudos". Variety.com. Retrieved 2011-04-04. ↑ "Jason & Justine Bateman At 1983 Youth In Film Awards". LIFE.com. Retrieved 2011-04-04. ↑ "Ricky Schroder At 1984 Youth In Film Awards". LIFE.com. Retrieved 2011-04-04. ↑ "31st Annual Young Artist Awards". YoungArtistAwards.org. Retrieved 2011-04-06. ↑ Miller, Daniel. "The troubled past and questionable benefits of Hollywood's oldest awards show for kids". Los Angeles Times. Tribune. Retrieved 27 September 2016.